Tony Herrin with the best brown of the morning. The 7 LB. hen was his biggest brown ever and released just fine. Tony Herrin with a nice brown hen. Tom Staley with his best brown that day. Tom Deane with this monster hookjaw from one of the Lake Ontario tributaries. Tom Deane sent us this photo of his grandaughter with her first brown! Tom Deane sent some fall photos of some really nice Ontario Lake browns. Todd with one of the "clone" browns we have been catching. Todd Reid sent me some photos of the browns he got into while on a recent outing to Wickiup. Todd Brown caught his personal best brown at Paulina Lake. The big male went 15 LB. Congrats buddy! Tim Friese with his biggest hook to date. This beautiful brown was close to the magic 10 Lb. mark but a few ounces short. Congrats Tim a killer buck! Tim Finnegan with a killer 20.5 LB. sea-run brown from Tierra Del Fuego. Thought we might have had a 10 the way he fought! Bounced around between 8.5-9 LB. Though not as many bites this past trip.....better quality size for sure. Though not as hot as last summer, Wickiup is still producing some nice browns. Though an Atlantic Salmon, it is a close cousin of a brown trout. Killer kype on this bad boy. 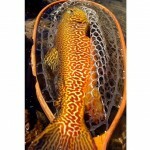 Though a tiger is a cross between and a brown and a brookie, they are probably the most beautiful trout of all! Those guys back east are really lucky to have Orchard Creek and big spawner browns to target in the fall. This Wickiup hen weighed 5.5 LB. and was released. This Wickiup buck was right around 7 LB. He was released. This was the first of (2) 7 Lb. browns I caught in less than an hour on a snowing evening in early June. This was the biggest brown trout that I had heard about from Wickiup this season. Just short of 20 LB.! This was our best of the trip. The wind came up and it was too tough to have any boat control. This snaky male was over 29 in. but was only around 8 LB. This short, fat hen had not spawned yet and weighed over 8 LB. This quality hen brown hit a kokanee pattern plug on the downrigger. This pretty male was 5 LB. and was released.